Manchester United have taken a larger share of the Premier League’s broadcasting revenues despite finishing second to Manchester City. They may have finished second in the league some 19 points behind Manchester City but when it comes to Premier League broadcasting payments, United are top of the league. 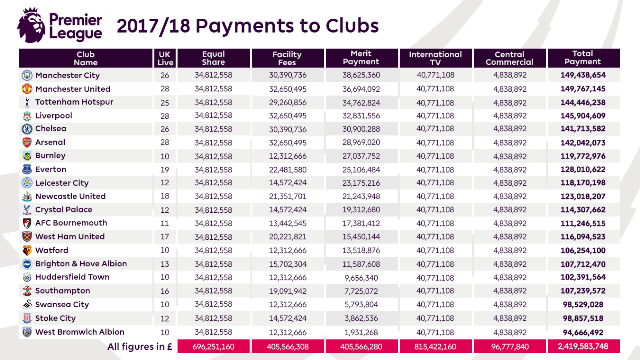 The Premier League has confirmed the value of payments of broadcast and central commercial revenues to clubs for the 2017/18 season today which shows Manchester United earned £149,767,145m, over £328k more than City (£149,438,654m). The bigger payment to United was the result of them featuring in two more live games over the season (28) than City who featured 26 times. Liverpool were the next highest earners pocketing £145,904,609m despite finishing fourth in the table behind Tottenham Hotspur, again the result of playing more games (28) over the season. At the bottom of the table, relegated West Bromwich Albion earned £94,666,492m but featured just 10 times over the season. In all over £2.4bn was distributed among the Premier League’s 20 clubs.